Custom consoles are the best, but unfortunately, not many of us ever get to own one. However, another chance has opened up, courtesy of Microsoft and NBA team Philadelphia 76ers. 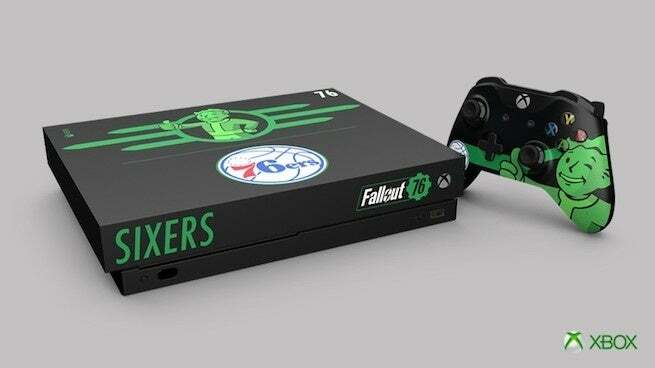 That’s right, in the latest Fallout 76 promotion, Bethesda is giving away a custom Fallout 76 Xbox One X with a little bit of Philadelphia 76ers sprinkled on it. In other words, if you’re not a 76ers fan, the console probably isn’t going to be for you. “The design incorporates a radioactive Vault Boy, who’s gone too long without his RadAway, and several elements from both 76 franchises,” writes Microsoft in a new blog post. The promotion will run the course of November and celebrate the upcoming launch of Fallout 76, a bold new-type of Fallout game that trades the single-player experience for a mutliplayer experience. To begin the promotion, Xbox and Bethesda notably took over a home game between the 76ers and the Detroit Pistons yesterday. According to Microsoft, going ahead there will be more unique collaborations and “reveals.” To make sure you don’t miss any, Microsoft advises you to pay attention to the Xbox, Fallout and, 76ers official Twitter accounts. It’s across these three accounts that how to win the “Radiocative” Xbox One X bundle will be revealed. Fallout 76 is poised to release later this month on November 14 via the PlayStation 4 and Xbox One. For those that don’t know: the game is an online prequel to the Fallout series where every surviving human is a real person, aka there are no NPCs in the game. The game is definitely meant to be played with others, but Bethesda has noted that you can play it alone if that’s what you’d like to do. Pitched as the “largest, most dynamic” world ever created in the Fallout universe, Fallout 76 is set during the year 2102, twenty-five years after the nuclear bombs began falling and destroying civilization as we knew it. Emerging from a vault of the nation’s best and brightest, your goals are simple: explore, quest, scavenge, build, and survive in one of the most hostile wastelands yet.